Making a surprise visit all the way from Singapore (! ), our good friend Daniel Cooper stopped by to play in our Friday quads. Also in the section were masters Oliver Chernin and Daniel Lowinger, as well as Melvin Patrick and Garrett Browning. The masters dominated, both winning their first two games and then drawing in the final round to share first place. 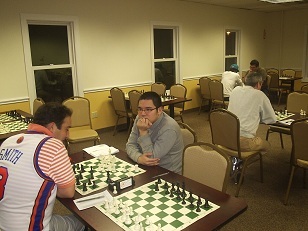 In another exciting showdown of the night, Al Pinto and Carl Scovens faced off in an exciting three game match. Scovens took the early lead, winning the first game and then clinched the match victory by winning in round two. However, Pinto struck back in the final round to avert disaster and save some rating points.